Time: perhaps the most scarce resource we have. Our family loves to cook for friends and family and it usually is an exercise which takes the whole day. We have fun doing it and seeing people. On the other hand, other days allow only a few minutes in the kitchen, so we look for dishes which are fast. 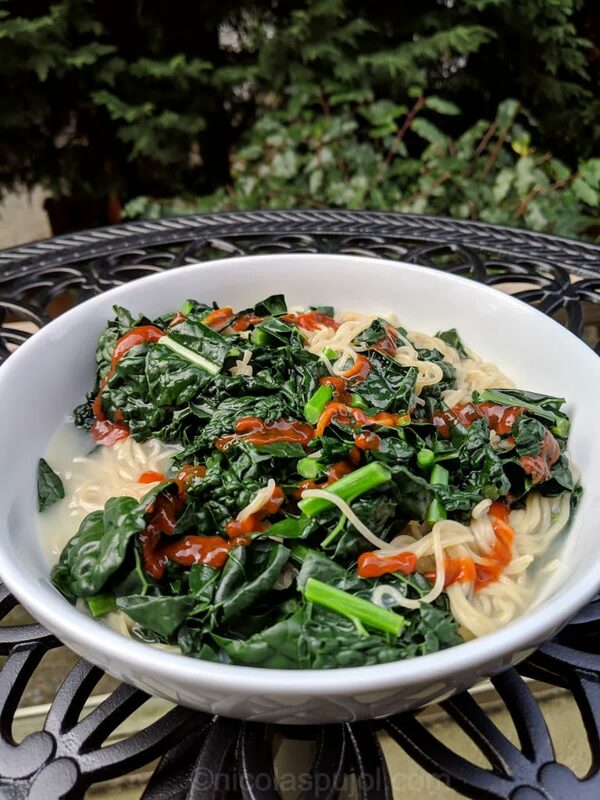 I bought rice noodles a few weeks ago to take a break from gluten, and have been enjoying their simplicity. They aren’t flavored and only contain organic brown rice flour, organic millet, and that’s it. No MSG, no nothing. 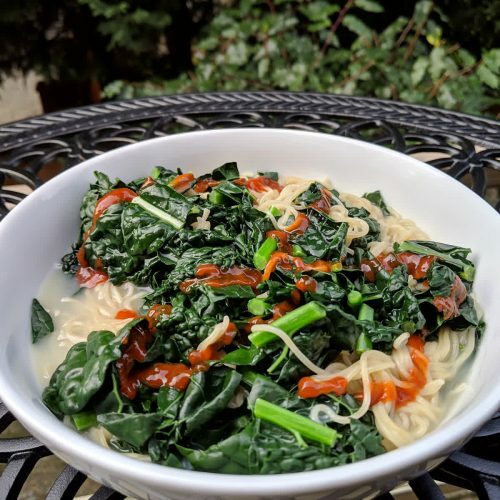 You can find something similar in most stores if you can ignore the companion flavoring powder which comes with the noodles, and make your own dressing. Adding lemon juice to pasta or to noodles is something common to do in Italy and France, although the tradition may be closer to just a few drops, instead of a half a lemon. Since we are not using oil for this dish, extra lemon came to make up for it. Sriracha hot sauce topped the dish, and you can use your favorite hot sauce instead, be it Tabasco or something else. 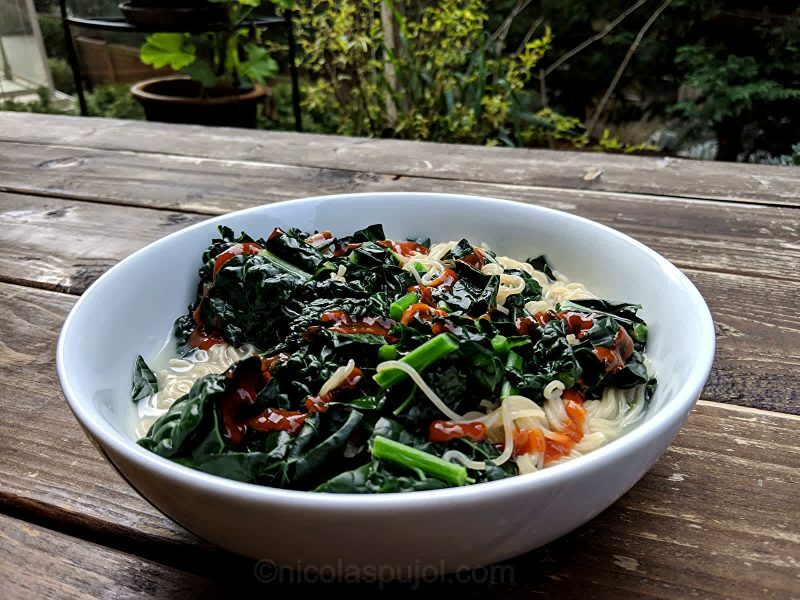 One last thing: to change from the usual curly kale, I cooked this dish using lacinato kale (more info at whfoods.com). 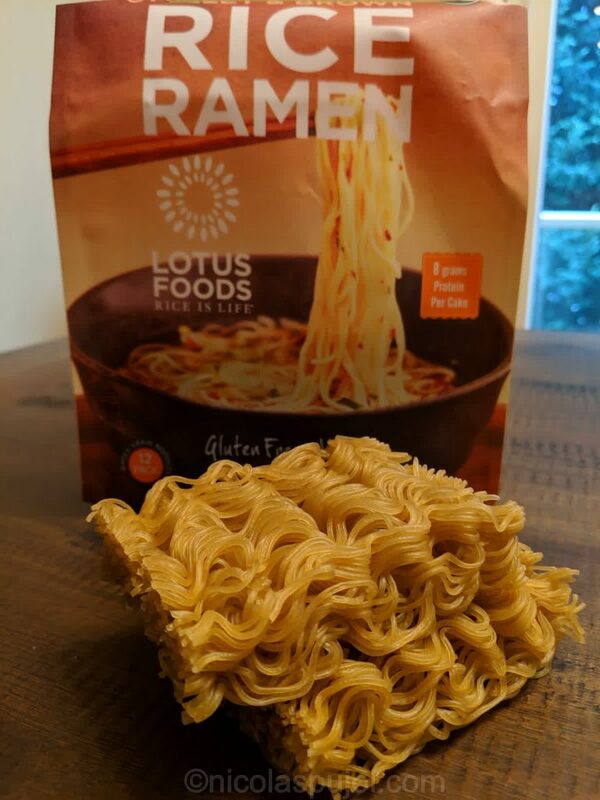 The flavor is very similar, it is just slightly softer than the regular one. But again, once you lightly boil it for 2-4 minutes, all kale gets soft. Put water to boil in a pan. 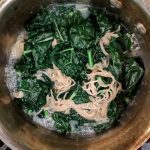 Estimate the volume to cover the ramen noodles plus a little more for the kale you will add later. A narrow pan is best, which will maximize the water height and keep the volume reasonable. Add the noodles, reduce heat and boil for 6-8 minutes until tender. Stir gently after 3-4 minutes to separate the noodles and make them even. 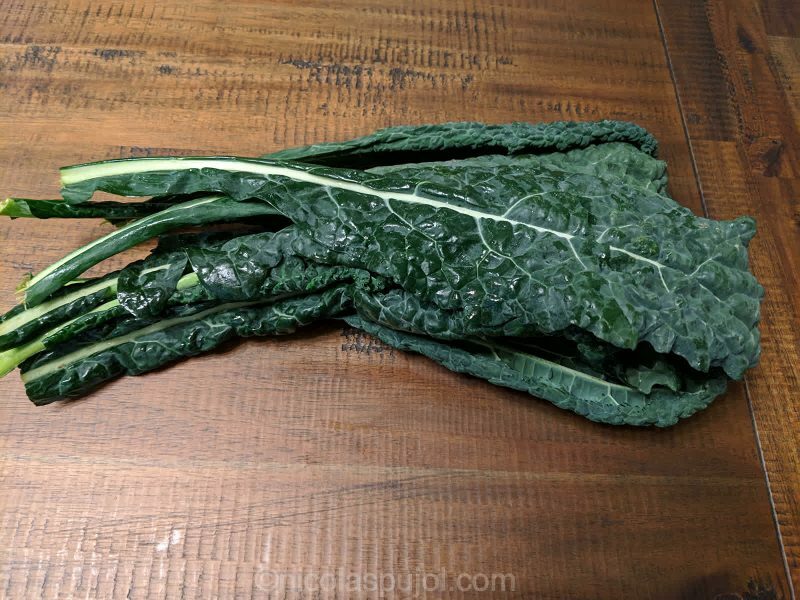 In the meantime, rinse and chop the kale. Discard the bottom of stems. Squeeze the lemon. 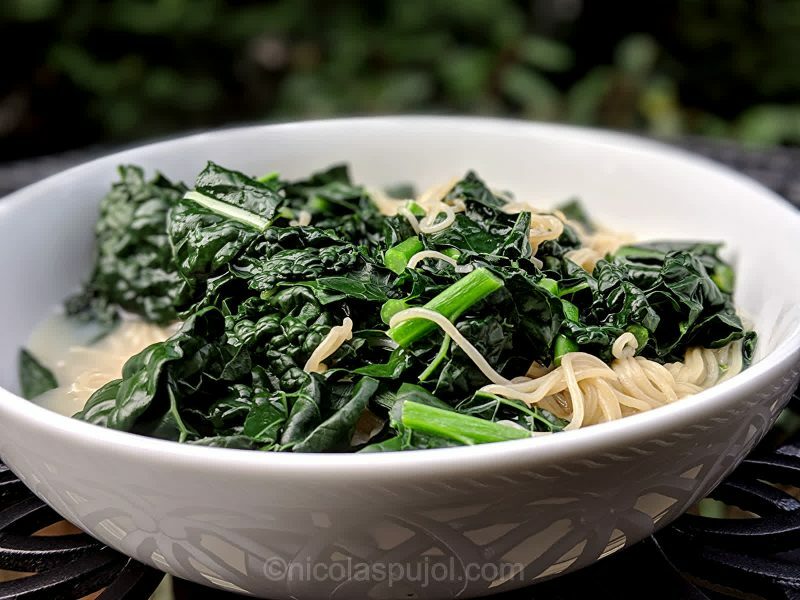 In the final 2-4 minutes of noodles cook time, add in the kale directly into the pan, then strain both. 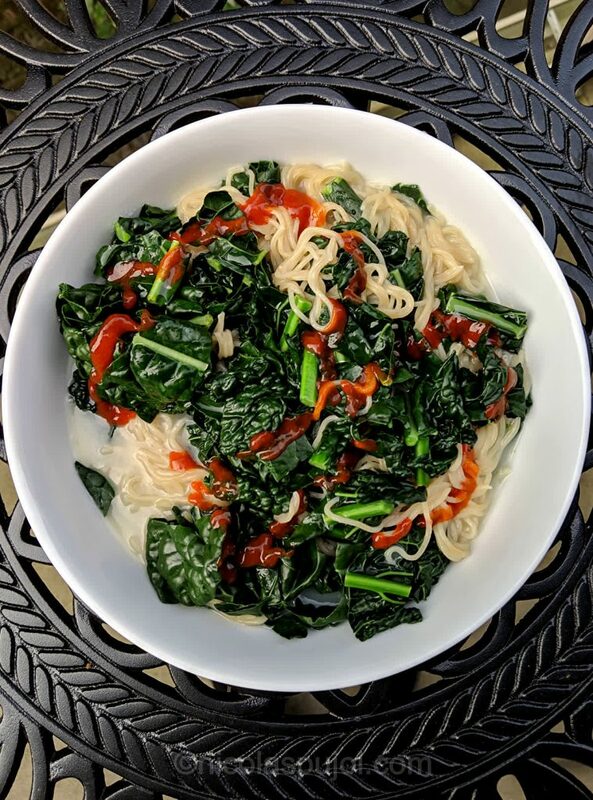 Place the kale and noodles in a bowl. Pour the lemon juice on top, and finish decorating with the hot sauce.